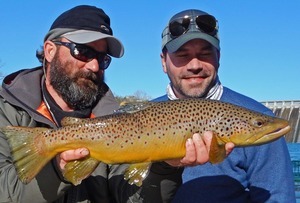 The White River should be your next destination for the White River fly fishing trip of a lifetime! On these tailwaters, almost anyone can go out and land a few fish on their own in low water conditions. But, taking full advantage of the White and Norfork's fluctuating water levels requires one key element: an experienced professional guide and boatman who has the patience, skill and knowledge to make your time on the water a success! 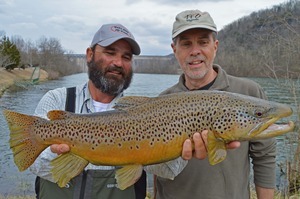 My name is Ron Yarborough and I productively guide over 65 miles of the White River below Bull Shoals Dam and all of the Norfork River for trout, along with over 40 miles of Crooked Creek for small mouth bass. Logging so many days on the river has left my computer skills a distant second! However, I've created this website with the hope that I can foster a love and appreciation for these beautiful rivers, as well as improve your knowledge and success in fly fishing here. As a continual work-in-progress, if you don't find the information you're looking for on my website, feel free to contact me anytime at ronflyfish@gmail.com or call (870) 688-1755. Whatever questions you might have, it would be my pleasure to steer you in the right direction. 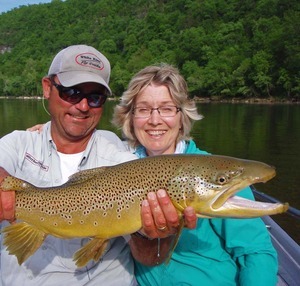 Located in the beautiful Ozark Mountains, Arkansas' famous White River and Norfork River offer unmatched fishing diversity, with enough options to satify every fly fishers needs. With several world, national and state records these tailwater fisheries have proven they have what it takes to grow quality fish. Plus the sheer number of fish here are second to none! I look forward to your questions, comments and conversation. 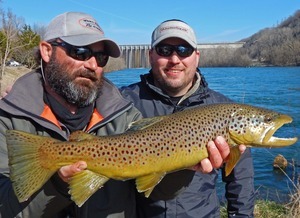 I love to talk fishing, and I would love to be your next White River fly fishing guide.